(Hays, KS – May 19, 2015) – HaysMed recognized several nursing Associates during Nurses Week. Kelsey Keith, Patient Care Technician (PCT) was recognized with the Caring hand PCT of the year. The PCT is a very important part of the patient care team as they extend the care of the nurse through positive interaction with patients and visitors by anticipating needs. 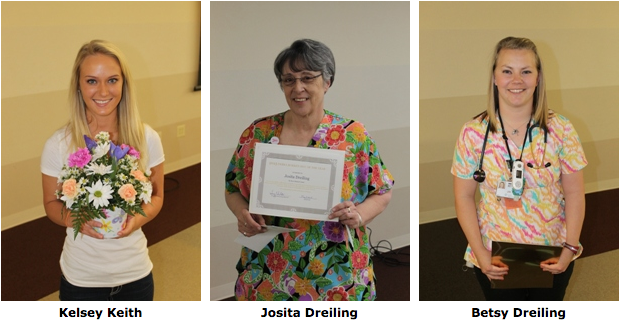 Josita Dreiling, Health Unit Coordinator (HUC) was named the Debra Boeken HUC of the Year. A HUC serves as the face of the unit and often sets the tone for how our patients’ family members and other visitors see the hospital and the care provided. The Lanita Smith LPN of the Year award was given to Betsy Dreiling. The LPN of the Year award is named after Lanita Smith, a former nurse that took pride in her role as an LPN and her ability to positively impact a patient’s life as a nurse in many different roles at HaysMed. This award honors an LPN who displays many of the same characteristics that Lanita had including kindness, compassion, concern and friendliness all the while being a great member of the patient care team. Keith works in the Skilled Care Department and has been with HaysMed since 2013. Jo Dreiling is in the Float HUC Department and has been an Associate of HaysMed for 32 years and Betsy Dreiling works in the Bone, Joint and Spine Unit and has been an Associate of HaysMed for 6 years.